… is better than a good day ‘most anywhere else. And I had a great one yesterday. I was delighted by the people, weather and events in Sharpsburg and at the Antietam National Battlefield Park on Saturday. I very much appreciate all the hard work and care the Park and Heritage Festival folks put into the Anniversary weekend – my hat’s off to you. Thanks particularly to Harry Smeltzer – a great battlefield-stomping companion. Together we ranged from town to field, tavern to auditorium. I’m usually a solo act, but Harry greatly enriched my day at Antietam. Thanks again, Harry. At the risk of putting both my readers to sleep, below is a description of the day. I’d generally planned out the day before arriving in Sharpsburg about 10am, but saved some wiggle room for distractions and side trips. A good thing, too. For the most part, I hung about the Save Historic Antietam Foundation (SHAF) tent in the midst of the Heritage Festival til about lunchtime. I think most of the Board members within a hundred miles were there. It was good to see Tom, Dana, Bill, Don, and Paula. Somebody got a group photo–we’ll see where that pops up. While there, I caught the superb 2nd Maryland Fife & Drum Corps performance [audio sample], then followed Harry over to the Christ Reformed Church and admired the newly restored stained glass windows. They are stunning in person. We also stayed for the battle of the bands between the 2nd Maryland and the Pennsylvania Wildcat Regiment Band. On the way to my first scheduled battlefield event–Ranger Brian Baracz ‘s 2-1/2 hour walk about the Burnside Bridge following the Union Advance [pdf] and Final Attack [pdf] trails–we stopped at the Visitor’s Center (VC) and met very briefly with Rangers and fellow bloggers Hoptak and Gentile. Those guys were very busy yesterday, but graciously took time to visit each of the several times we ran into them over the day. I had a glorious time ‘stomping’ the hills south of Sharpsburg with about 30 friends in the care of Ranger Baracz most of the afternoon. I’d not walked that ground before, previously relying on distant views from the park roads. Dang what a difference. Along the way I oriented to the Carman maps (my versions from AotW) and connected the features before me to those on the map. With more help from Brian’s excellent narration, the scene became considerably less confused in my mind. We arrived back at the Visitor’s Center in time–just after 4–to miss the infantry demonstrations, but catch the artillery. A pair of bronze Napoleons (top picture) firing black powder. Always a treat. Thanks here to Ranger Al Preston (above) over from Turner’s Gap to narrate the show. He always does a fine job. It’s the racket those great guns make that I think I like best, though, sorry Al. While there we learned a little more about John Hoptak’s project to restore the sword to General Nagle (noggle) atop the 48th Pennsylvania Infantry monument at Antietam. Please do keep an eye out for how you can help. I also enjoyed the gorgeous vistas to the east beyond the VC, the fleecy clouds, and the near-perfect temps, only hinted-at in this photograph. Sorry if you missed it. 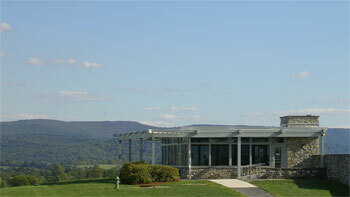 The day’s last scheduled event was Professor Rafuse’s talk about General McClellan at Antietam, but it wasn’t til 7pm. 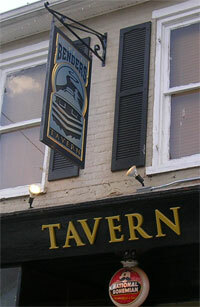 That left time for a quick bite and a beer at Captain Bender’s Tavern, recommended by knowledgeable local and famed gourmand Tom Clemens. The draft hefeweizen was excellent, but watch out for the Cajun Chicken. My gums are still smoking. Bender’s is right in the middle of Sharpsburg at 111 East Main–you can’t miss it–and looks to be a popular local watering hole. Very comfortable. Ethan Rafuse’s evening lecture at the Visitor’s Center was a recap of the key points he makes in his book McClellan’s War, but he was most interesting when answering questions from the floor afterward. He was excellent on his feet and off the cuff. If you haven’t already read McClellan’s War and are open to a more rounded and nuanced view of the General, I recommend it to you. I think Ethan is one of the best around at making the case that McClellan did what he needed to do in Maryland in 1862, and that he ought to be judged against his mission and the reality as he saw it, rather than as we perceive his situation in hindsight today. An excellent and thoughtful discussion on which to close the day at Antietam. Over the course of the day I met face-to-face with a gaggle of people I’ve been reading or corresponding with for the last decade or so, having oddly not crossed paths with them before. Around the popular SHAF booth in town early in the day I met the famous Tom Shay: videographer, photographer, guide and student of the battle. Tom’s posted part of his day online already – I hope he’ll also share the video he shot at the historic Christ Reformed Church in Sharpsburg, site of those stained glass memorial windows to Connecticut and Pennsylvania soldiers at Antietam. 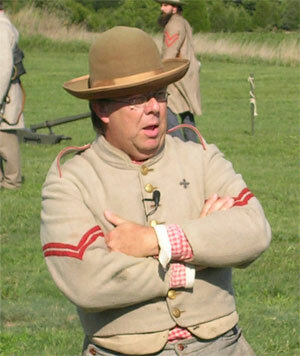 Also in Sharpsburg, and later at the battlefield Visitor’s Center I shook hands with Ted Alexander, Park Historian. Ted is one tremendously busy guy this weekend, but took a few moments to chat with a couple of seedy-looking bloggers (sorry Harry). Ted was still going strong at about 9pm as he saw us out of the VC. Talk about your dedicated public servant. I was honored to meet up with Larry Freiheit and his wife, in town and on an afternoon hike. A warm and energetic pair indeed. Larry has been doing graduate study on the battle, and is the author of our current Featured Exhibit at AotW on JEB Stuart and his cavalry in Maryland. He hinted at another work coming for us on Military Intelligence activities on the Campaign, so I’m looking forward to that. I finally got to speak in person with Angela Clemens, too. Angela is a professional photographer, and we have a set of her superb photos from a 2005 artillery demonstration at the Park. I’ll try to talk her into getting some more of her work on line soon. She and Tom also had me out to their back-deck at day’s end, where I froze happily chatting with the Clemens’, Harry, and celebrity author Rafuse til way past my bedtime. 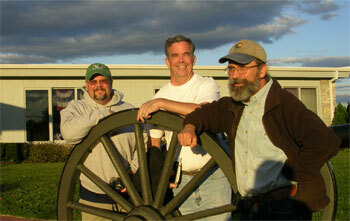 Not forgetting, Harry and I cornered Mannie near sundown for the second in the series of Bloggers at Antietam photos. Properly there should have been four of us, but I think Ranger Hoptak was off home to Gettysburg by then. Harry got a picture of John earlier, though, which I hope he’ll post on Bull Runnings. Handsome lot, aren’t we? A fine day all round. Thanks for the kind words, Brian, on your great site here. I agree with your assessment of the lecture. In fact, I was tempted beforehand and may well do this in the future, to just pitch the prepared lecture and just play off audience questions. The problem is, though, that the audience comes in prepared for a lecture and I am not sure how a discussion will go without having provided, especially those in the audience who have not done much study of the war previously, some food for thought in the form of the lecture. Thanks for the perspective Ethan – you were clearly having more fun with the spontaneous part at the VC lecture. I see what you mean about audience expectation. Thanks also for making the trip and showing the flag, so to speak. I finally got the chance to create an AVI of the video that I shot at the historic Christ Reformed Church in Sharpsburg. I posted the info on TalkAntietam.